Think raw stone on your walls is more country than modern? Think again. As Komal Sheth, founder of Spaces Designed, proves with this interior, using rough natural materials can make a statement that's at once bold and relaxing. In this space, repeated lines on the floor, stone wall, shelves, and artwork evoke a sense of order and calmness. Designers talk non-stop about pop's of color, and this space is a great example of why that's so. An orange wall here adds warmth, brings out rusty tones in the stone wall and ties the two spaces together. Take into account the round mirror and curved accessories and this space is the picture of balance. We see shapes, materials, and textures come together to make a cohesive story of modern style. Help! 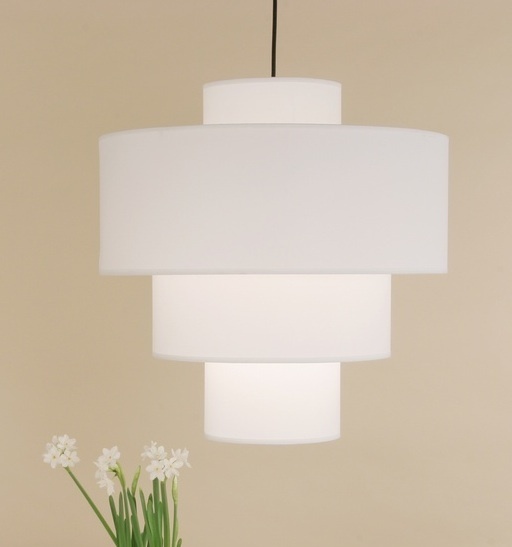 I've been casually looking for a chandelier to dress up my dark and dreary dining room. It's open to the living room and its gigantic crystal thing I never would have bought but which has been here since the house was wired for electricity, and isn't leaving now. 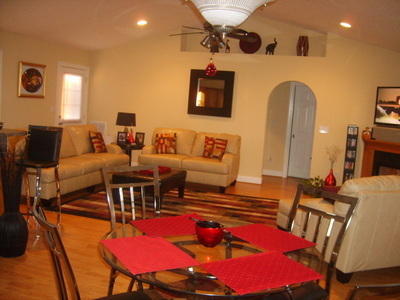 So on the left, the living room. 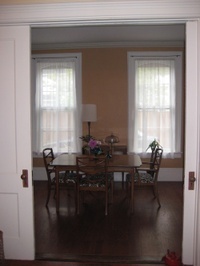 On the right, sad little dining room that needs some love (a rug, new chair covers, window coverings, color...). The rooms are next to each other with pocket doors separating them, so each picture was taken while I was standing in the other room. Does this make sense? I think it's a good way to recognize the past but bring it into the present. The shapes work together and it's so much more minimal. Now you've got to picture it with a little more life happening in the dining room too. When Bill leaves Baghdad, Iraq and goes home to Reston, VA, he eats and entertains in this unique dining room. He chose Arne Jacobson's Fritz Hansen chairs in red to contrast with lime green walls and provide strong silhouettes against his glass tulip-base table. 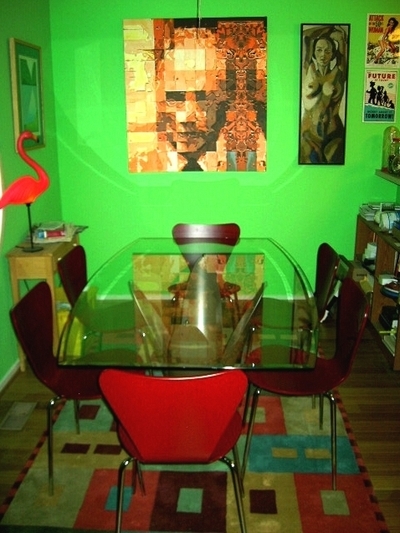 He added a bold area rug over bamboo flooring to anchor the table and chairs and then rearranged his existing artwork. Bill calls this look modern and eclectic. Looking at the Flamingo lamp, we're thinking there's some kitsch in there too. What's your take? Rate his effort in the comments section and then Show Us Yours! Tags: Home Makeover, Pure Contemporary, Readers Rooms, Modern Design, Real Makeovers. When Vickie sits down to watch the tube in her Smyrna, GA house, she's also admiring the entertainment cabinet. 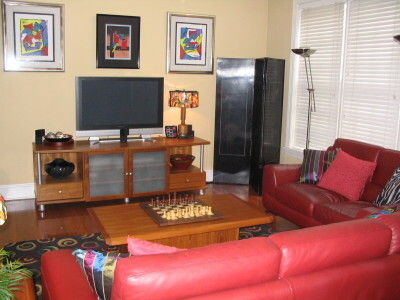 "I purchased the Visions base cabinet in November 2005 because I wanted a flat panel TV and needed a nice piece of furniture to put it on. I have a small space and wanted something contemporary. I also wanted a piece of furniture to blend with my existing furniture, which is teak, with simple lines. Luckily, I happened upon your ContemporaryFurniture.com and the rest is history. I can’t tell you how often people that visit my home compliment me on this piece of furniture." Rate her effort in the comments section and then Show Us Yours! 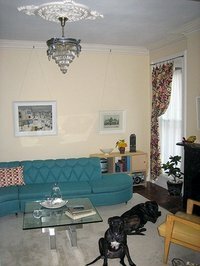 Is there any rule against using an Oriental Rug with Mid-Century, modern furniture? I would like to warm up the room, and I think this may be a nice way to do it. Any advice would be appreciated. Rules, shmules. There isn't one and I say go for it. 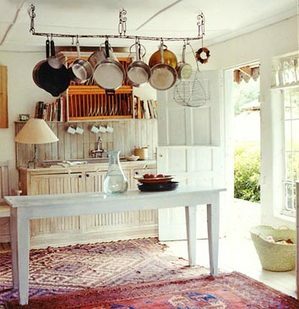 As you say, adding an oriental rug will warm the room. It will also give the space a sense of history that will ground your mid-century furniture and give the finished look a richer vibe. This does depend a bit on color coordination - make sure your rug and furniture go together in terms of hue and the styles will enhance each other. I found an image from this month's Domino which shows two kilims under some simple, clean lined Shaker furniture. I include it because I think the effect of an oriental rug with your furniture will be similar. Convinced? Do it! And send us a picture of the finished product. Anyone else who wants to chime in, we welcome your comments (below)- and pictures of your pad (to me). This is Pure Contemporary reader Tia's house in Statesville, North Carolina. She's created individual spaces in an open floor plan without making the space seem smaller or too compartmentalized. She did it by keeping the color palette uniform throughout the space and defining different areas with area rugs, lighting and accessories. Rate her effort in the comments section and then Show Us Yours! Tags: Home Makeover, Pure Contemporary, Readers Rooms, Modern Design, Readers Rooms, Real Makeovers.